If you’ve spent time on the RPF, or looked through our Ultimate Smoothing Guide, you may have heard of Flexbond. It’s a Rosco product that is meant to be used as a glue for foam and other materials, designed for stage and screen use. 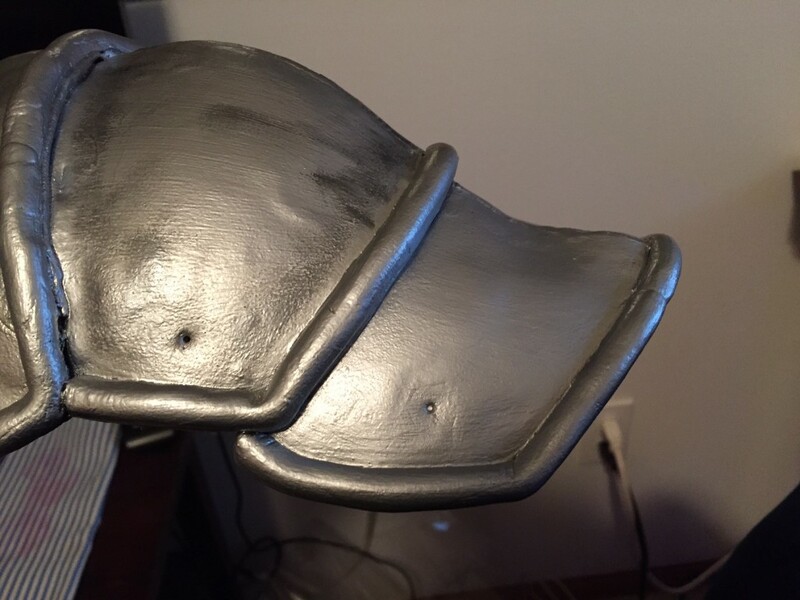 Cosplayers, of course, always find new uses for things – and for those who could get their hands on Flexbond it’s become one of the preferred primers for sealing all types of foam before painting. 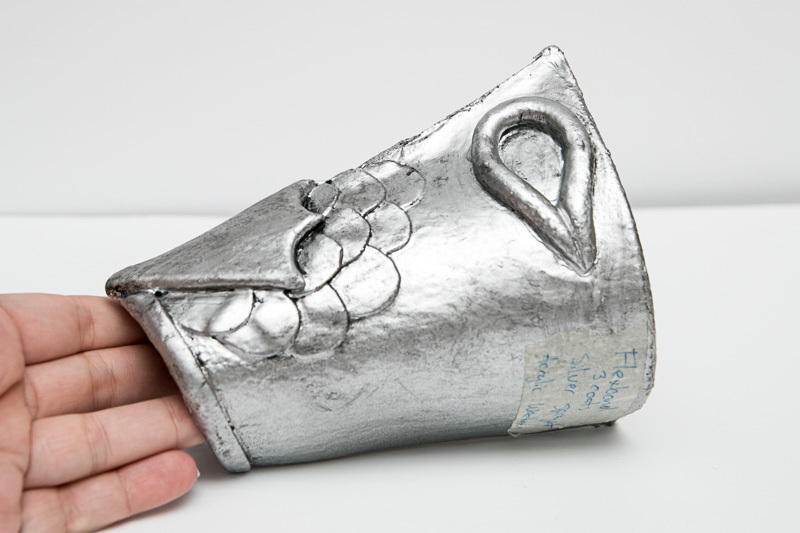 Last year, we had several customers use it for Worbla – and when we saw the results we knew we had to make it accessible to everyone. 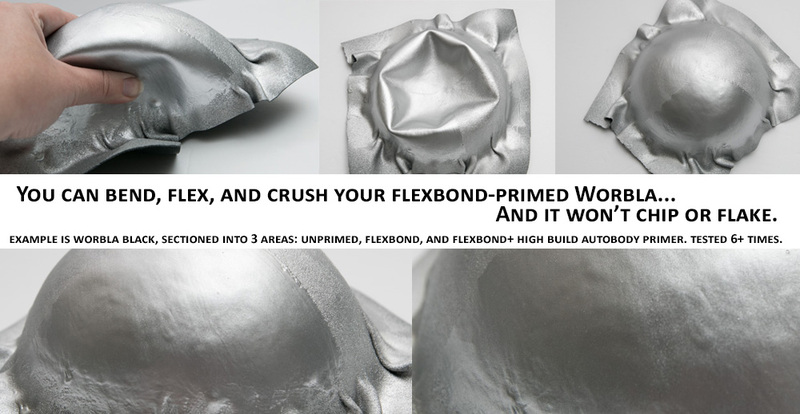 Flexbond has a few specific points that make it really, really handy to use for quick armor priming to get a very smooth finish without too much time or labour. Flexbond has a high surface tension, so brush strokes even out easier than other coatings, giving a smoother surface. Flexbond is meant to be a glue, so it ‘grips’ itself as you add layers – minimizing drips and runs when applied in thin layers, while still drying without a tacky finish. Flexbond is water soluble, so if you do have drips or runs, they’re easy to fix without having to repair a large area. Flexbond dries clear fast – faster than any other brush-on primer. Flexbond is non-toxic, and can be used in small spaces – it doesn’t smell bad and won’t poison you with fumes. Flexbond, like the name suggests, remains flexible. 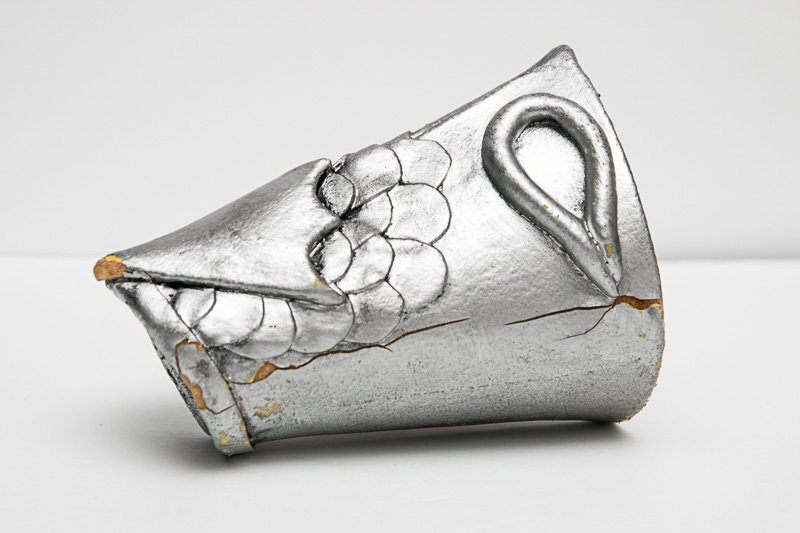 Pieces can be flexed and struck without chipping or cracking. Toss your armor in your luggage for airport security or build designs that flex on and off without worrying about your finish or last minute touch-ups. Flexbond will coat thermoplastics and foam with the same finish, meaning that you can coat pieces at the same time and paint them without distinct surface differences. Flexbond can smooth Worbla’s Finest Art to a smooth, paintable finish in as little as 3 coats, and Black Art in 2, though your mileage (and personal preference) may vary. We aren’t saying Flexbond is the best primer ever – there are so many ways you can prime that saying one way is best is just silly! We have a whole section dedicated to the different methods people have shared with us! We are saying it’s one of the best options we’ve found – and if you ask for our suggestion for Worbla, Flexbond is going to be at the top of the list! Wait, why isn’t everyone using this stuff? We worked with Rosco for a year to create bottles that are far more cosplayer friendly. 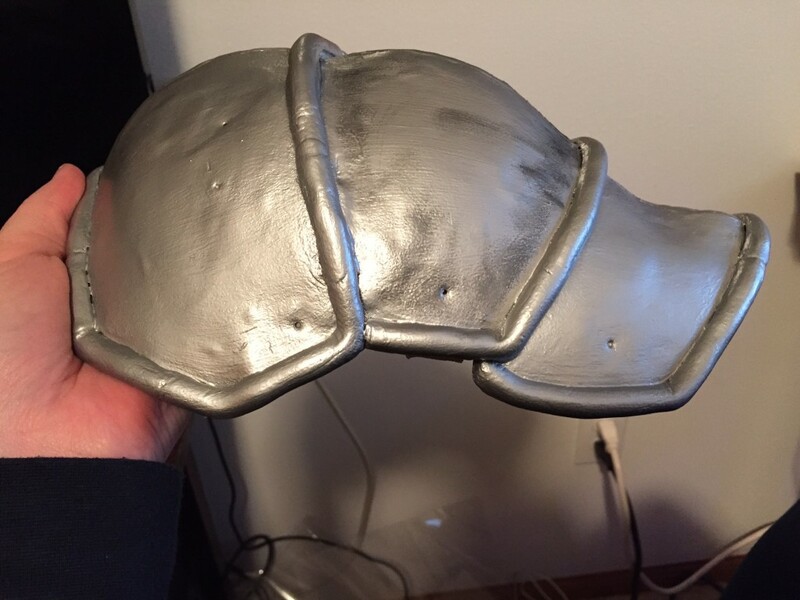 We’re introducing 16 oz bottles exclusive through Worbla.com and Cosplay Supplies.com – enough to cover a very large armor project with leftover, small enough to be an easier price point! We’ll be selling the one gallon bottles as well and shipping worldwide, if you do have a really big project to tackle! Right. So. Let’s see it in action? Above: 2 coats of Flexbond on Black Worbla. 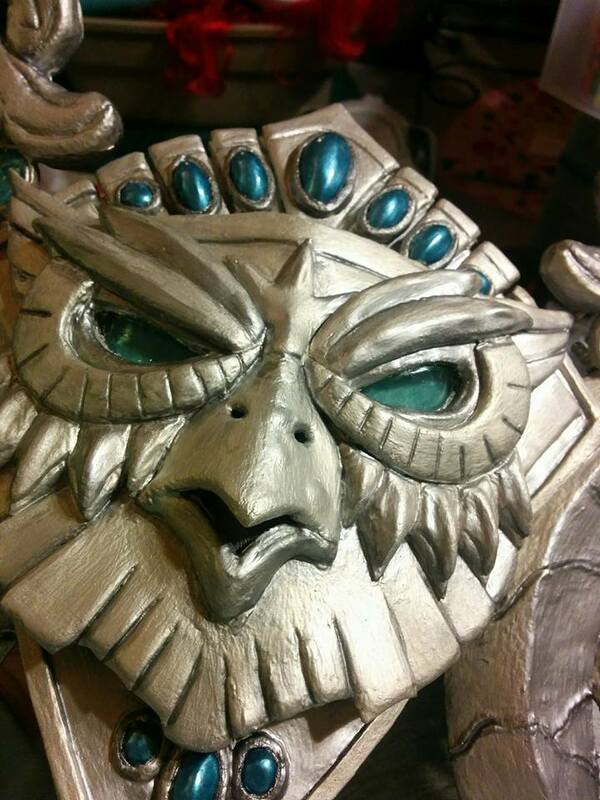 Lanthea Cosplay used Flexbond to prime her bow, pictured above: “I used 3 coats of flexbond on the regular worbla bits (everything but the owl section) though I did sand down the regular worbla a bit prior to priming and 2 coats on the owl which is black worbla. I applied it with a damp brush so that it would spread a bit easier. I love the results, the black worbla parts are amazingly smooth. I found it works a lot like wood glue. Once it starts to dry it develops a skin and if you go over that part again with your brush it tends to tear a bit. I’m used to mod podge which has a bit more manipulation time but I got the hang of it pretty quickly. I did try to sand it, and it may have been because I am impatient and didn’t wait for too long before I tried but it did tear a bit in those spots. I would definitely try wet sanding if I felt the need to do that but it didn’t really require any sanding. 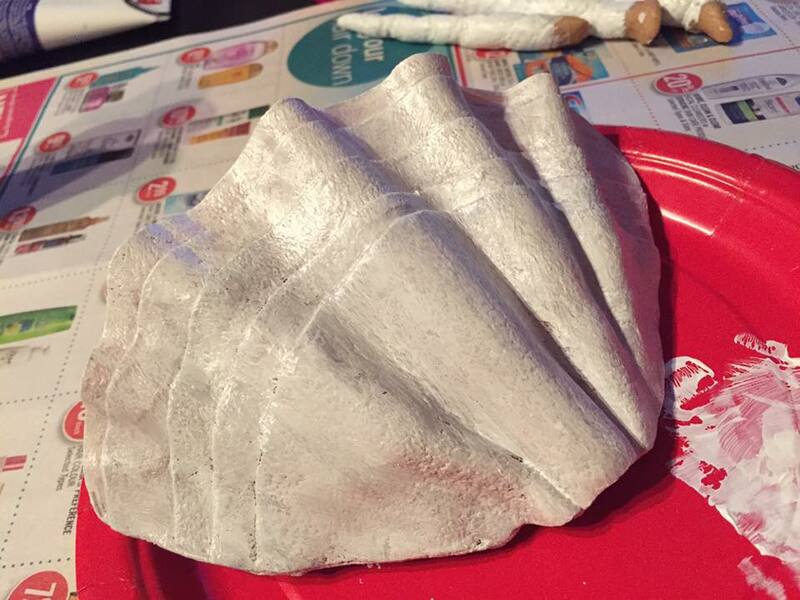 VickyBunnyAngel used 1 coat of Flexbond as a primer for her seashell, to keep most of the texture for an organic feel. From left to right: Mod Podge, Gesso, Flexbond, PVA (white) glue, Carpenter’s (wood) Glue. 2 coats each. Flexbond. Hammer marks somewhat visible if you squint you can see the ‘c’ shape. Carpenter’s Glue cracked the worst at the sides where the worbla bent. Mod Podge tore away from the surface. Gesso is almost totally intact – I managed to chip it in one tiny spot. The PVA glue created a ‘skin’ that cracked and would lift away from the worbla when twisted. From left to right: Gesso, PVA (white) glue, Carpenter’s Glue, Mod Podge, Flexbond. Of course, you’re not likely to take a hammer to your costume pieces! But travel, luggage handling, crowded convention spaces – or just dropping a prop or piece of armor – can all mean a headache of patching and repainting, with standard primers. Both forms of glue work to prime Worbla’s Finest Art and Mesh Art, but Carpenter’s Glue dries very hard (and brittle) and waterproof and can be sanded smooth, while PVA glue remains water soluble and more flexible, but often doesn’t ‘bond’ to Black Worbla, instead making a ‘skin’ over the surface. Keep this in mind when someone refers to ‘wood glue’ if their results are different than yours! 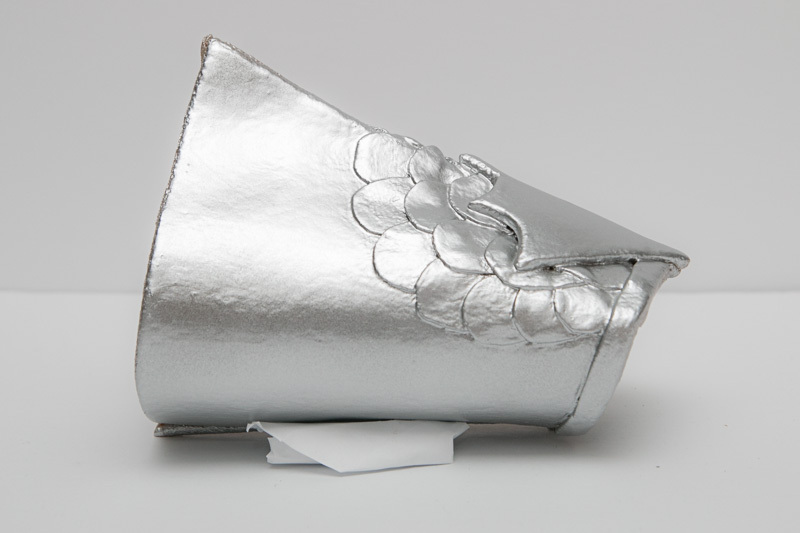 If you did check out the Ultimate Smoothing Guide, you’ll remember the bracers I made for all those tests last year. (Expired) Flexbond, a year later…. Still flexible as always, no cracks or damage. Carpenter’s (wood) Glue, a year later. 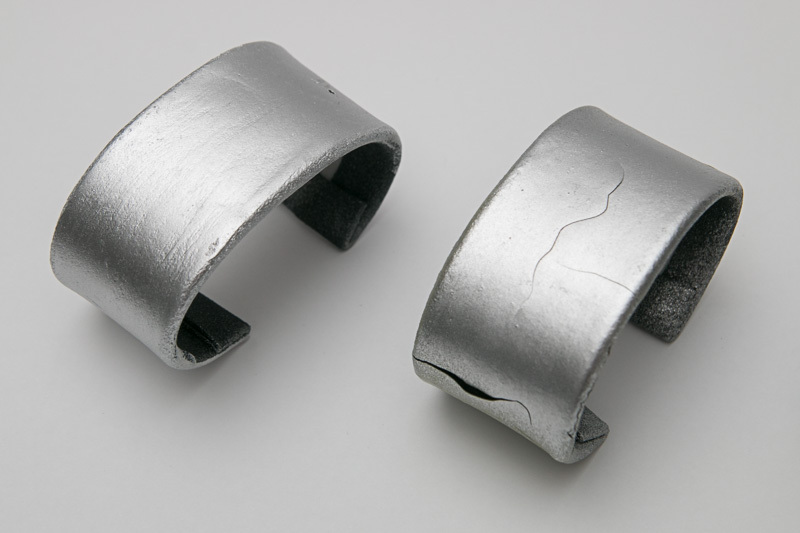 The above pieces were stored in the same locations, taken to the same conventions, thrown around in the same luggage containers by the same TSA agents. Also worth noting, the Flexbond I used for my initial tests was pretty expired, and as a result created a more ‘rippled’ effect. 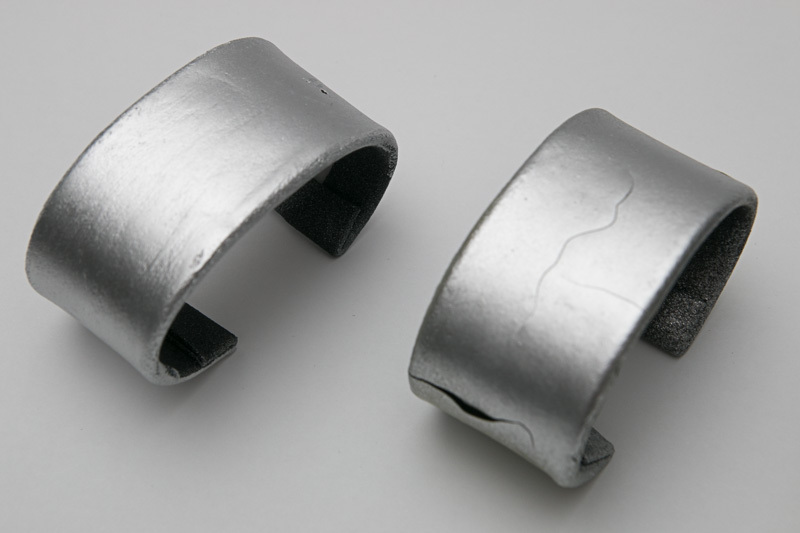 As I’d made a bunch of bracers to test against, I applied my new Flexbond to a bracer for comparison. Click to enlarge. Common brush-on primers compared on Finest Art and Black Art. 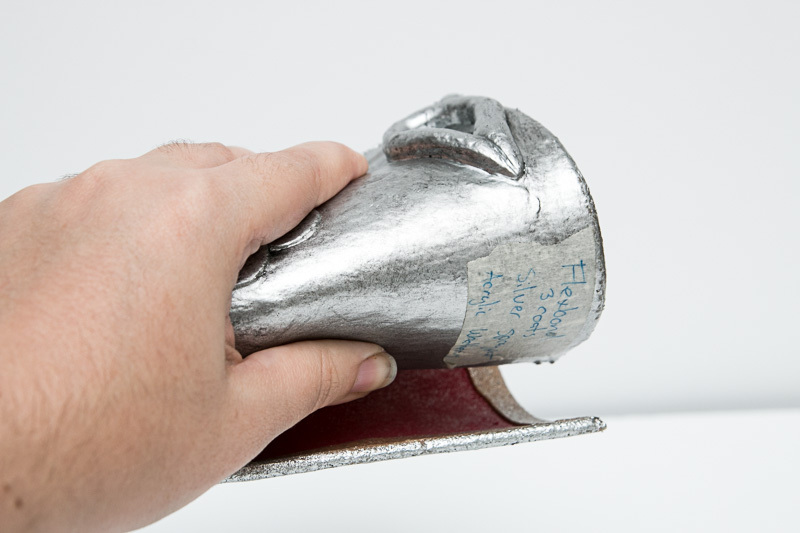 Flexbond does more in less, without requiring sanding and while remaining flexible and durable. Flexbond can be used standalone, or combined with other products, and the findings in the Smoothing Guide can be used as a much more comprehensive breakdown/comparison of Flexbond and other Primers. In the next few weeks I’ll be creating some tutorials that show both using Flexbond on its own, as well as mixing it with other primers to cut down your priming time further or to get the smoothest finish possible. That was too much text. Recap? Need to use a primer that can be safe indoors/around kids and pets/won’t smell? Use Flexbond. Need a primer that will give you a smooth finish in less coats and without needing to sand? Flexbond. Need something that will keep your paint from chipping and flaking off under stress? Flexbond. 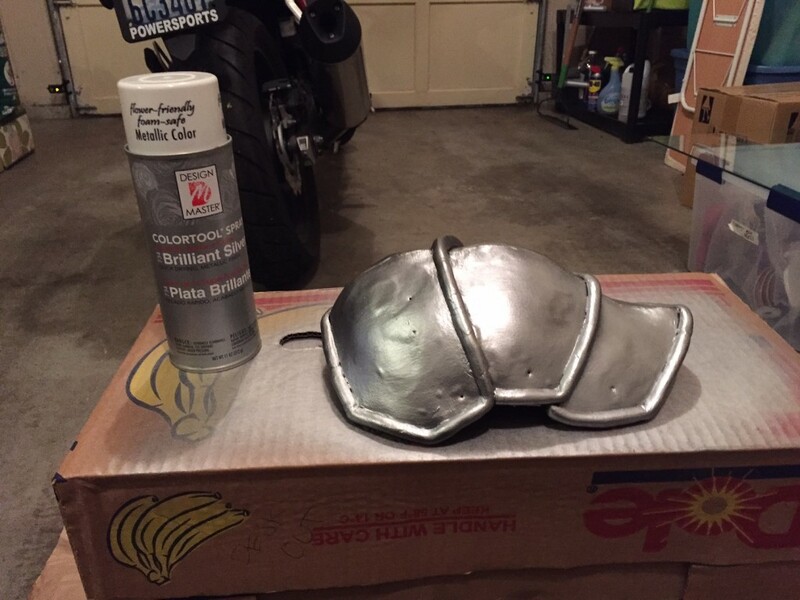 Need a last minute topcoat and can’t spraypaint? Flexbond works as a semi-gloss topcoat too. 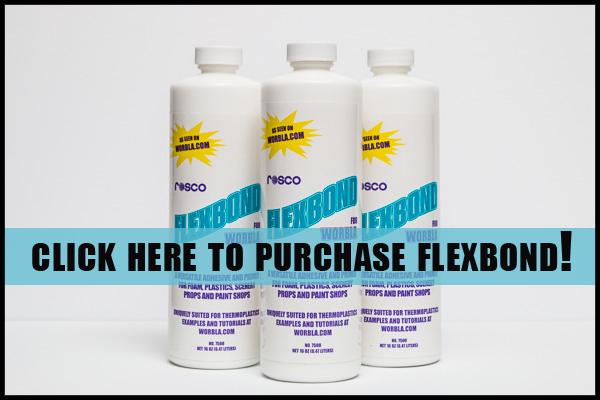 When purchased with any thermoplastic at Cosplaysupplies.com, the 16oz bottles of Flexbond have free shipping! The one gallon bottles will have separate shipping cost calculated based on location. We now have a page dedicated to Flexbond information and tutorials here! Use a medium to large brush compared to your project, or a sponge brush, to help coat the surface evenly and minimize brush strokes. Use a somewhat damp brush to apply Flexbond for the smoothest finish. Apply thin layers, being careful not to apply so much that it will want to drip and run. Resist the urge to go over and over an area – Flexbond sets up quickly enough you can end up having very noticeable brush marks. Allow layers to dry fully (they will be clear) before applying the next. Mistakes, brush strokes, drips and runs can be carefully smoothed with a damp finger or brush, or gently wet sanded. Flexbond will reactivate with water, making for easy cleanup. Flexbond isn’t recommended for prolonged exposure to skin, so wear gloves if you plan on being really really messy. 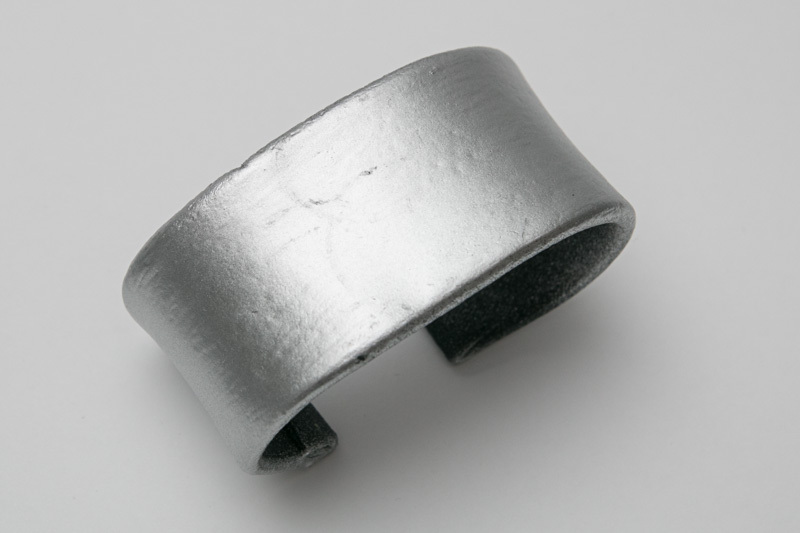 It can be wet sanded, but it can’t be sanded dry – it has a ‘skin’ that will peel and tear. The first layer of Flexbond dries faster than subsequent layers. 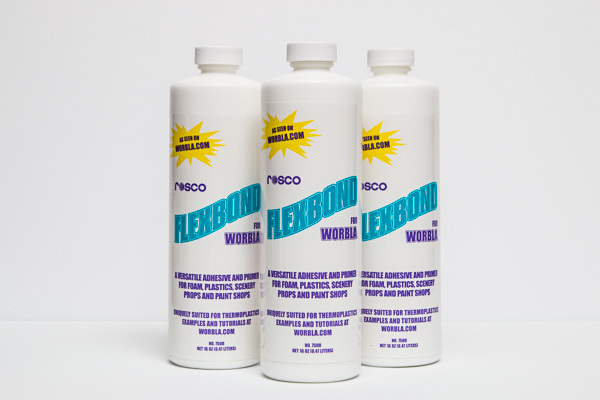 Flexbond also makes an excellent glue for Paper Mache when you need some durability and flexibility, and it has been used watered down for wig styling as well. Flexbond can be watered down, but keep in mind that if thinned too much and applied to a plastic or foam surface, you may get ‘bubbles’ or ‘breaks’ in the surface tension. Experiment first before applying to a large project. Flexbond can be mixed with paint or tint, so you can save time by mixing your base color in your Flexbond for your later layers. Also: Your Flexbond will have a Bottled On Date (at the bottom). Remember that it will start to lose its consistency after 24 months. Okay, wait, but the price? Bottles will be $22USD and $26 Canadian, with free shipping when purchased in any thermoplastic order. One gallon bottles will be $55USD/CDN and shipping will be additional and based on region. The one gallon bottle is obviously much more product than the 16oz holds – 8 times the size – but isn’t 8 times the price. This is because we had to have the smaller bottles decanted professionally, as Rosco wants to ensure their product quality, and so it could not be done in-house. Flexbond can absolutely be decanted into airtight containers yourself – so consider if you have a group of friends who may want to split a larger bottle to save costs. Just make sure you all note the original bottled by date, and that the containers you use are airtight. But I like my current priming method. Everyone has their own way – and we showcase half a dozen methods so far in our tutorials! If your method isn’t on our list, let us know! We think Flexbond is one of the best ways, but it isn’t the only way by any means! Longer Answer: Flexbond has been tested on: basically every possible foam out there, Wonderflex, Worbla’s Black Art, Worbla’s Finest Art, Worbla’s Mesh Art, Worbla’s Deco Art/Friendly Plastic, Worbla’s TranspArt, Thibra, wig fiber, paper/newsprint/cardstock, felt, fabric, air dry and bakeable/hard clay. The list is probably even longer. 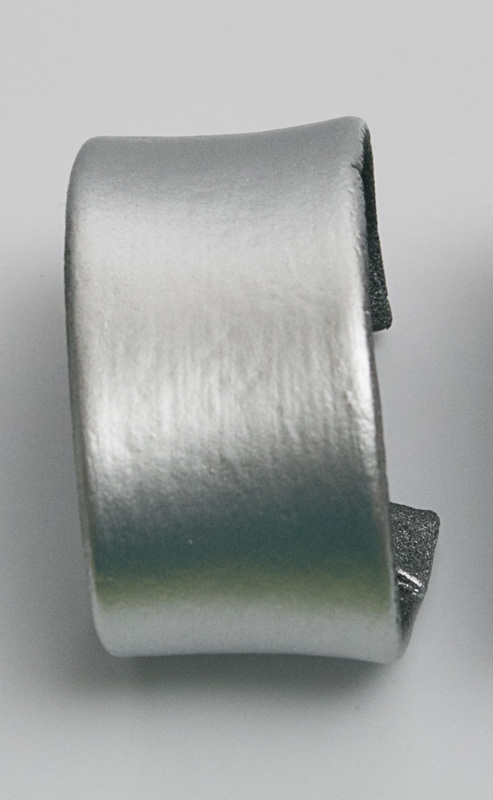 We haven’t found a finish that can’t be applied over Flexbond, and Flexbond can be mixed with paint to tint it. You can mix 50/50 with acrylic paint to act as a paint primer, for example. You can use it as a base to build up a flexible surface and then use high build auto body primer, or other spray finishes, to help cut time down on creating the smoothest finish possible. The top tier is just 3 layers of flexbond, then 3 layers of spray paint, second layer, same, but with some black rub n buff, bottom tier, same as top, but with one layer of acrylic paint. I found that adding the acrylic paint actually helps diminish the brush marks left from the flexbond. “Overall I found the product really easy to use and a little bit goes a long way! Watering down after the first layer is an absolute MUST. Also patience is a virtue. Many of my brush strokes are visible because I did not wait until the previous layer was dry so it ended up being brushed on rather thickly and seemed more smudged and thick than smooth and thin. My suggestion for the perfect smoothness would be: 1 layer of flexbond, no water. Let dry completely (about a half hour). Then paint on your next layers while your brush is damp. NOT wet. If your brush is wet it will leave what looks like bubbles of water (should’ve taken a photo argh). For black worbla I would suggest 2 layers of that, regular I would suggest about 4. Pros: Smooth, doesn’t smell bad, easy to work with, little goes a long way. For the photos… the top tier is just 3 layers of flexbond, then 3 layers of spray paint, second layer, same, but with some black rub n buff, bottom tier, same as top, but with one layer of acrylic paint. I found that adding the acrylic paint actually helps diminish the brush marks left from the flexbond. I’ll hopefully have a finished piece pictured and up soon, but I plan on using that whole bottle on my chandra armor set! Miss Messy Mia also tested Flexbond for her upcoming projects. 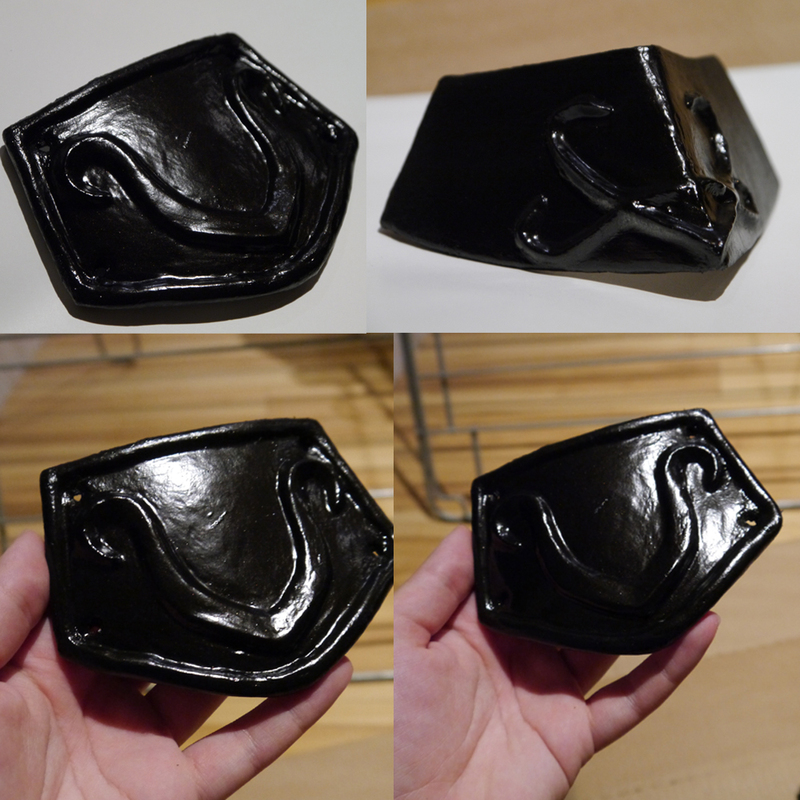 Fairly quick to cover up worbla texture, tends to only take 4-5 layers and 3 was pretty good for Black worbla. that fact that it starts white and dries transparent makes it particularly easier to apply, although it is still tacky for a certain amount of time when it is transparent. honestly any negative is pretty much the same as when using glue. When sanding I once or twice rubbed too hard which took away a portion of the flexbond. VickyBunnyAngel Cosplay also used Flexbond to prime her coral pieces for her upcoming Sakizou costume. 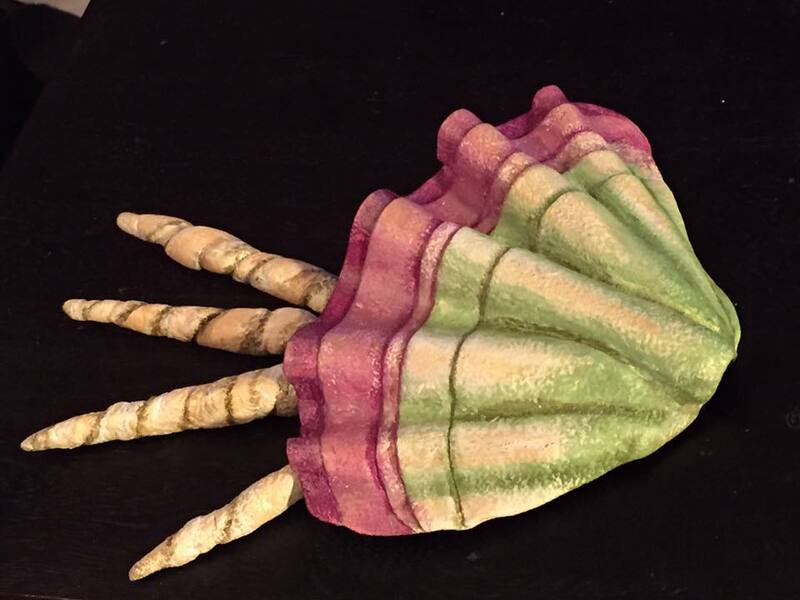 Primed and then painted coral from Worbla’s Finest Art. Right side: 0-3 layers of Flexbond, from bottom to top. More questions? 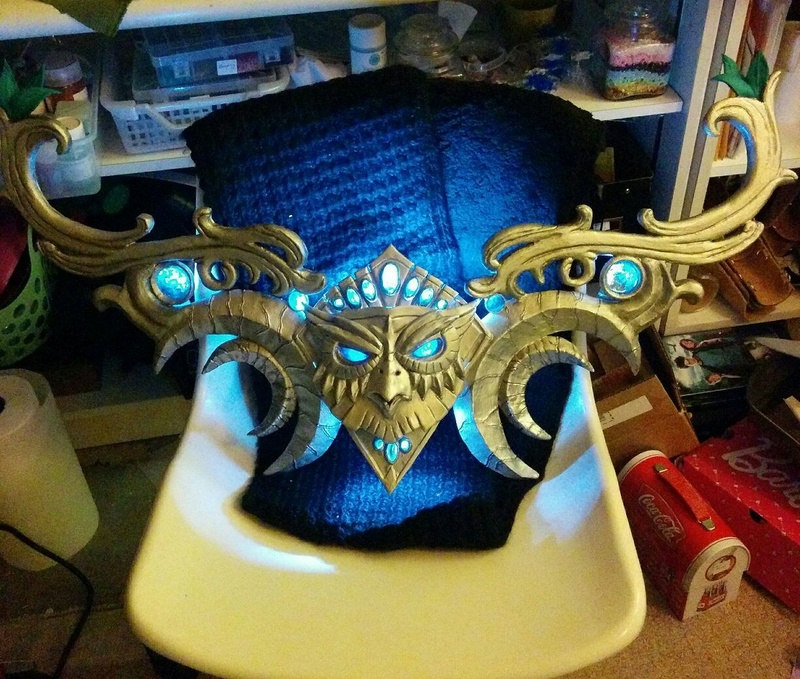 Have you used Flexbond for your own Worbla and have images or other tips and tricks to show? Email Amanda@worbla.com with them!